As you could see from yesterday's post. We got hit by a blizzard. So, today's "Embrace the Camera" is more snow fun. Kind of. Sweet P is only 6 months old and although she's getting around pretty good inside, it's a totally different story once she has her snow gear on. Maybe next year we'll get to go sledding!!! How's the weather where you're at? Hope you're staying warm! Cute pics! I love a bundled up little baby :) We have snow and it is cold where I live ~ yesterday's high was 9 today it is suppose to get to 21.... heat wave really. Ha! How cute! We have a ton of snow here too and so I have been off work for 3 days now. Loving your blog though! Check out my 14 Days of Love Challenge and show those you love, you love them! I love babies in snow suits! Look like little caterpillars! 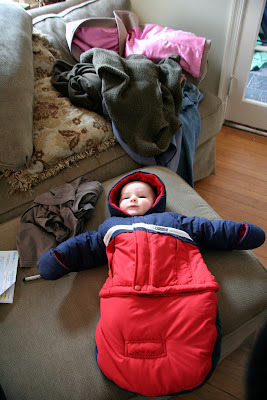 I love the snowsuit! So cute! down here in dallas, we got hit with the ice. and so, the world stopped for 2 whole days. i'm not complaining tho...it meant daddy was home! cute pics! 1. Snow babies are too cute. 3. My family lives in Owasso! We're neighbors! Except I live in VA. Thank you all for your super sweet comments! It makes being snowed in a bit more tolerable! love sweet P all bundled up! and you are a styling mama. Embrace the Camera - And the Outdoors!